Hedge Fund Due Diligence provides a step-by-step methodology that will allow you to recognize and avoid questionable hedge funds before its too late. 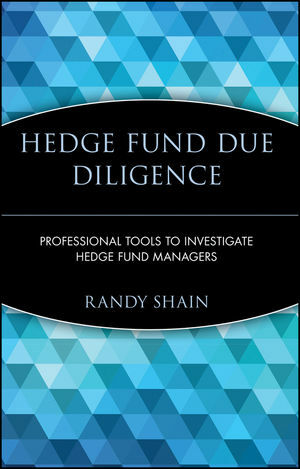 Based on a framework that hedge fund investigative expert Randy Shain has refined over the course of his successful career, this book offers an overview of due diligence into hedge fund management, how information on managers can be obtained, and why this information is essential to your investment endeavors. Randy Shain is Vice President at First Advantage Investigative Services, producers of the BackTrack Report, where he examines funds and fund management. Since 1993, Shain has examined more than 2,500 funds and 4,500 hedge fund managers. His due diligence work has expanded as the number and size of hedge funds has skyrocketed, with more than 9,000 funds, managing more than $1.2 trillion today. As part of his work, Shain examines court filings, criminal records, news clippings, and conducts extensive interviews. Chapter 1. Hedge Fund Growth – What It Means To The Institution. Chapter 2. What Is Due Diligence? What Are The Various Types Of Due Diligence? Chapter 3. What Kinds Of Hedge Fund Failures Do The Press Discuss? Why Do Most Hedge Funds Really Fail? Chapter 4. Can The Chances Of Investing In Future Failures Be Lessened/Prevented? How? Chapter 5. Investigative Background Reports – The Beginning: Identify Your Target. Chapter 7. News Media. Is Nexis Your Only Option? Chapter 10. Corporate Records: Not Just D&B Anymore. Chapter 11. The Internet: What It Can Do And What It Can't. Chapter 12. Public Records – Is That All There Is? Chapter 13. What You Think Is Helpful, But Isn't. Chapter 16. Warning Signs, Red And Yellow Flags.